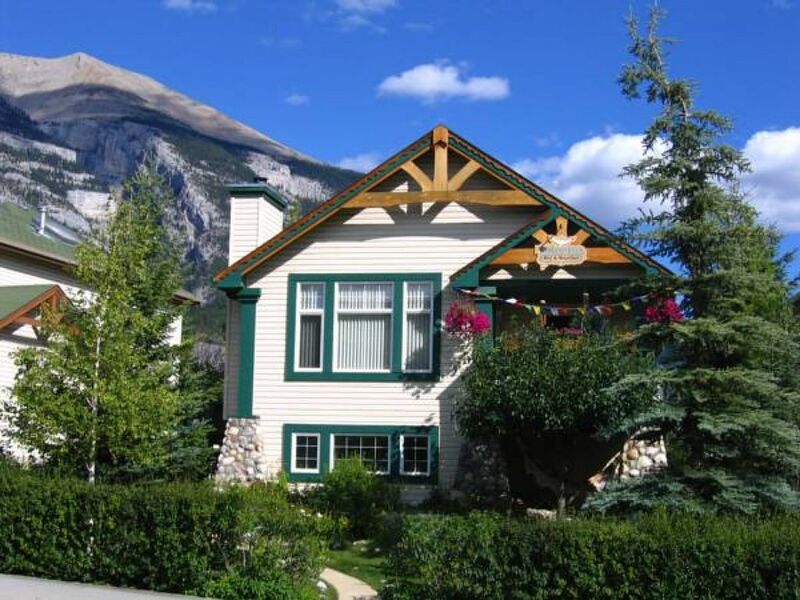 Situated on the sunny side of Canmore at the feet of Lady MacDonald and Grotto Mountains and nearby Cougar Creek and Canyon. This Bed and Breakfast features a lovely Suite which provides privacy and serenity. It is an open space Living room/Bedroom with private entrance through patio doors that lead to the furnished patio and backyard garden. It offers free parking on the property, full ensuite bathroom, gas fireplace, home theatre system for CD listening or DVD viewing, library with books and games, free WIFI, phone and fax, ample storage space, a small fridge in an adjacent room. It is clean and lovingly decorated and furnished with warm and cozy pine furniture including a Queen size Sleigh bed and a Queen size Sofa bed. Avens ReNaissance B&B strives to respect nature, it's resources and our health and provide amenities that enhance such goals. You will be delighted by mountain and garden views. A continental breakfast is included and served or self-catered between 7 and 9 am, unless otherwise arranged, on the upper floor's dining nook. Mostly organic foods. Please specify special diets. Downtown Canmore is 5 minutes by car or 20 minutes by foot from the property. Banff National Park is a 20 minutes drive and Lake Louise approximately 45 minutes drive away. Canmore is surrounded by National and Provincial Park that offer endless adventures, sightseeing, and activities. The rate is based on double occupancy, includes continental breakfast. No tax. 5% service fee. My B&B is situated on the sunny side of Canmore at the feet of Mount Lady MacDonald and Grotto Mountain. Hiking/biking trails, scrambling, rock climbing and Cougar Creek/Canyon are just a couple minutes walk from the house. Also nearby is the Iron Goat restaurant and bar, and the Cougar Crossing with Cafe, Liquor Store, Convenience Store and more. Downtown Canmore is also nearby and only takes minutes to get to depending on your mode of transportation. Canmore is surrounded by Provincial and National Parks. The town of Banff is only 22 km away and accessible by car, bus or bike. The rate is based on double occupancy, includes hearty breakfast. No tax. Extra person fee of 30 per person per night after the first 2 guests.